When the state-based insurance exchanges open next year under Obamacare, many Americans should finally have access to affordable insurance. But millions of others will most likely be left out in the cold and remain uninsured. These folks -- mainly low-income adults in the 21 states that aren't expanding Medicaid -- will not be eligible for either the long-standing government health insurance program for the poor, or for premium subsidies in the new exchanges. Some 4.9 million people will not be covered in 2016 if these states don't expand, according to the Urban Institute. 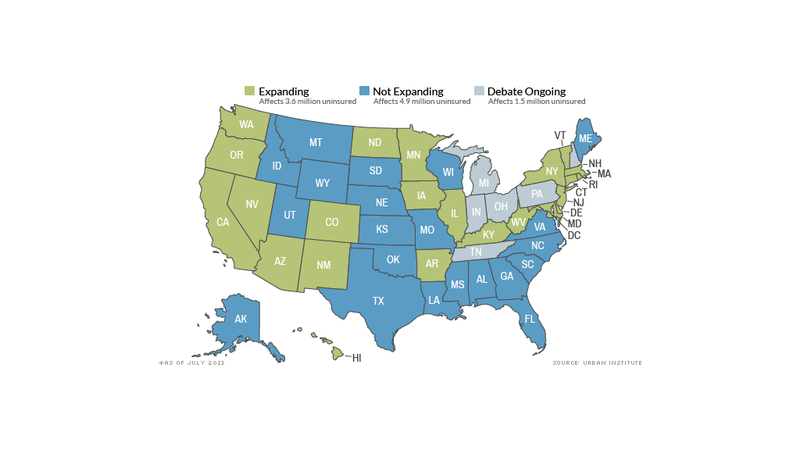 Another 1.5 million uninsured are in six states that are considering expansion, but have yet to approve it. "You have a group of low-income adults who really don't have any affordable options for health insurance," said Benjamin Sommers, assistant professor at the Harvard School of Public Health. This gap was not supposed to happen under the original Affordable Care Act, as Obamacare is formally known. All adults with incomes below 138% of the poverty level -- $15,850 for an individual and $32,500 for a family of four -- were to be covered by Medicaid. Those with incomes between 138% and 400% of poverty would receive federal subsidies to defray the cost of buying insurance on the state-based exchanges. But a Supreme Court ruling in June 2012 left it up to each state to decide whether to expand ... and only 23 states and the District of Columbia chose to do so. 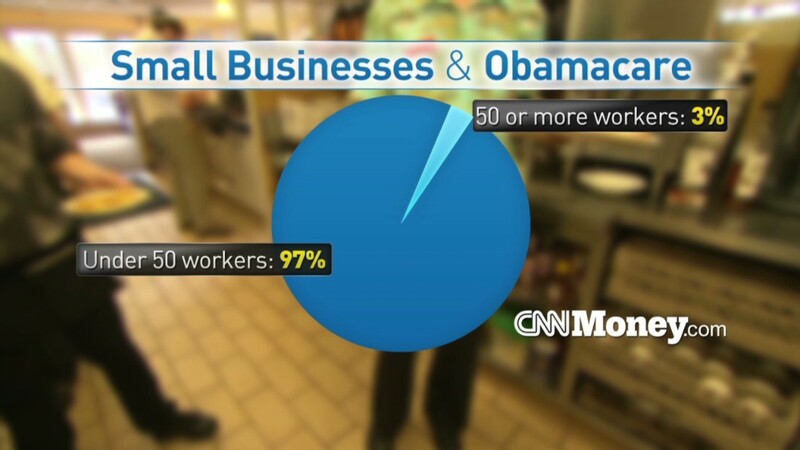 In these places, Obamacare will work as originally envisioned. The problem lies in that the law does not allow those under the poverty level to receive subsidies for the exchanges if their state doesn't expand Medicaid. These people will not be charged a penalty for not having health insurance. Very few non-disabled, working-age adults qualify for Medicaid now. While eligibility varies by state, many do not cover childless adults and only provide insurance to parents with very low-incomes. Take Texas, which has the highest number of uninsured residents in the nation and some of the most restrictive Medicaid eligibility rules. To qualify, working parents can make no more than 25% of the federal poverty level, or $4,770 for a family of three, while jobless parents can make no more than 12%, or $2,290, according to the Kaiser Family Foundation. Were the state to expand Medicaid, enrollment would jump by 1.5 million people in 2016, according Urban Institute estimates. But Texas is one of the states that has opted out of the expansion. Those people who remain uninsured may be able to seek care at community health centers, which are expanding thanks to an $11 billion infusion under Obamacare, said Timothy Jost, professor of law at Washington and Lee University. And tax-exempt hospitals have to provide more charitable care under health reform. It's still possible that states will join the expansion program in coming years. Governors and lawmakers there are facing heavy pressure from consumer advocates, as well as interest groups such as hospitals, which treat the indigent. After all, it took years for all states to join the original Medicaid program, which was founded in 1965. All but one state had signed on by 1972, and Arizona didn't opt in until a decade later.